The Miami Township Police Department received an initial award of CALEA accreditation in 1996. In 2016, the department received their seventh award of reaccreditation. Over the years, CALEA has bestowed many honors on our department related to the accreditation process. The department has also been deemed compliant with current standards as established by the Ohio Collaborative Community-Police Advisory Board. Any questions related to law enforcement accreditation or certification may be directed to Jennifer.Ryan@MiamiTwpOH.gov. The Law Enforcement Accreditation Program was the first credentialing program established by CALEA after its founding. It was originally developed to address what was seen as a need to enhance law enforcement as a profession and to improve law enforcement service delivery. That mission continues today through a tiered law enforcement accreditation program. 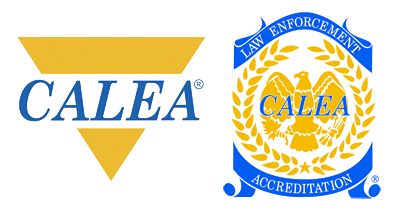 Participating agencies may enroll in either CALEA Law Enforcement Accreditation or CALEA Advanced Law Enforcement Accreditation, without regard to agency size. Additionally, these programs are open to all types of law enforcement agencies, on an international basis. And, these programs provide specific standards to support law enforcement agencies functioning in the college/university environment. They provide a process to systematically conduct an internal review and assessment of the agencies’ policies and procedures, and make adjustments wherever necessary to meet a body of internationally accepted standards. •CALEA Accreditation requires an agency to develop a comprehensive, well thought out, uniform set of written directives. This is one of the most successful methods for reaching administrative and operational goals, while also providing direction to personnel. • CALEA Accreditation strengthens an agency’s accountability, both within the agency and the community, through a continuum of standards that clearly define authority, performance, and responsibilities. Being CALEA Accredited can limit an agency’s liability and risk exposure because it demonstrates that internationally recognized standards for law enforcement have been met, as verified by a team of independent outside CALEA-trained assessors.